LONG ISLAND CITY — When Jay Hachadoorian's career as a competitive triathlete starting winding down a few years ago, the longtime personal trainer and running coach began hunting for a new workout routine to keep him motivated. "I had a friend who was kind of big-time into CrossFit, and I was looking for something new, training-wise," Hachadoorian said. The 40-year-old Woodside resident was soon hooked on the fitness program, an increasingly popular one that stresses high intensity workout movements and constant variety. Four years later, he and a business partner have opened their own gym — or "box" as its called in the CrossFit community — in Hunters Point, at 10-20 47th Road, a few doors down from The Yoga Room. 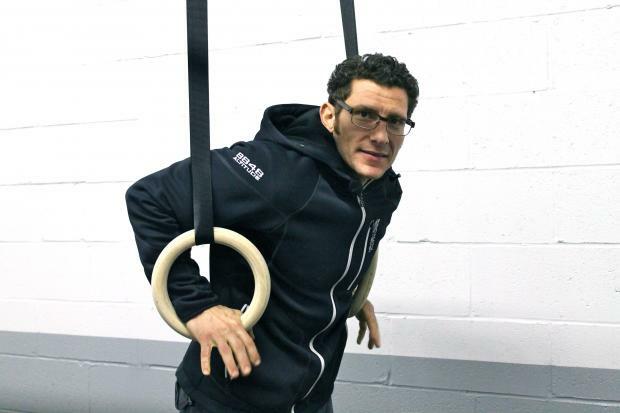 CrossFit Gantry had its open house this past weekend, and Hachadoorian says they're looking to help neighborhood residents to break out of their workout ruts. "The basic idea is you’re never doing the same thing everyday, and routine is kind of the enemy," he explained. "The continued variety creates a more well-rounded fitness." In April, a Brooklyn-based company, Kettlebell Kitchen, will begin delivering paleo meals to Gantry and three other CrossFit locations around the city. Massage and physical therapists will also be available several times a week, Hachadoorian said. CrossFit Gantry doesn't look like a typical fitness center. Inside the high-ceilinged warehouse, the space is sparse compared to a traditional gym. There are a set of rowing machines on one side, gymnastic rings on the other, weights and other equipment, but it isn't packed with machines. That's because CrossFit workouts relies instead on what are known as bodyweight movements — like pull ups, push ups, sit ups, squats, lunges — combined with barbell weight lifting and conditioning movements like running, swimming or rowing. It's a competitive kind of fitness, Hachadoorian says, where the aim is always to improve your own performance and fitness ability. "That’s one of the things that really appealed to me about CrossFit, because the goal was always to beat myself," he said. "Every work out became a competition with myself." He says he was also drawn to the community aspect of CrossFit, saying those who do it are a tight-knit group — most within a given neighborhood know one another — and socializing is a key component of the training, something he thinks is missing from traditional workout routines. "You go to the locker room, you change, you go jump on your elliptical for 45 minutes with your headphones on, you go back to the locker room, change and leave. You’re in and out of the gym in an hour and you haven’t talked to a soul," Hachadoorian said. "In CrossFit, you end up working out, training, sweating with people, and they become your friends, your confidants, your allies." CrossFit Gantry will be offering special rates for the month of February, including a special fundamentals class for beginners: $200 for six introductory classes, followed by two weeks of unlimited membership. Experienced CrossFitters can choose from an unlimited package at $175 a month, three classes a week for $150 a month, or two classes a week for $125 a month. CrossFit Gantry is located at 10-20 47th Road in Long Island City. For more information about class schedules or to register, visit www.crossfitgantry.com.